Print your logo onto these custom printed mccurio cheese board & knife sets or one of our other innovative chopping boards and use them in your next marketing campaign as a unique giveaway item. The McCurio set has a Rectangular cheese board with upright magnetic knife display block. This is a handy set for functions or office celebrations, easy to access and compact to store away. The Magnetic block folds down when not in use for convenient storing. Acacia wood is known for its unique and natural contrasting patterns, no two units are identical. Presented in a premium book style gift package. Engrave Knife Handles (Set of 4): 10mm Diameter - extra $2 per unit. Screen Print: Box: 250mm H x 180mm W - extra $1.20 per unit. Pricing below includes 1 Engraving on the Board. Custom brand these realtor bamboo house shaped cheese boards or one of our best-selling promotional kitchen gadgets»chopping boards with your company logo! Your promotional mccurio cheese board & knife sets can be silk screen printed in 1 or more colours. Costs shown include a 1 colour logo print on your custom branded mccurio cheese board & knife sets. We can print more than 1 colour, however it incurs extra costs. We can achieve a perfect PMS colour match for the print. Engraving your logo on the promotional mccurio cheese board & knife sets is usually done by Laser engraving, where the laser removes a thin layer of the metal surface. Your logo becomes part of the mccurio cheese board & knife sets and is impossible to remove. Sometimes the engraved effect will be a different metal colour to the outside metal coating of your product. We can also engrave wood or plastic. Engraving is usually a more expensive branding method. Personalise your mccurio cheese board & knife sets or custom design chopping boards for your marketing campaign. 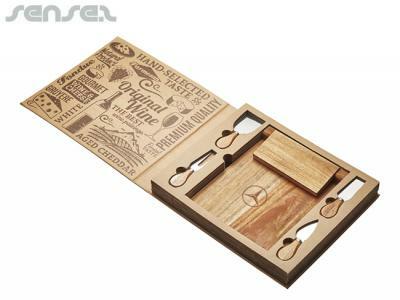 How can these unique promotional mccurio cheese board & knife sets or our personalised chopping boards fit in with your marketing strategy and help you maximise your brand exposure? Our custom made McCurio Cheese Board & Knife Sets can be produced from a minimum quantity of 10 pieces. We can have your logo branded on these corporate McCurio Cheese Board & Knife Sets in 1 Colour Silkscreen Print or Engraved. A setup fee of AU$120.00 will apply to make the film.